It’s lovely to be back! It feels so nice to be blogging again! My school placement is now over, and I am very proud to have received an Outstanding grade! This is graded against Ofsted criteria for student teachers, so I am over the moon! I have been getting back into the swing of healthy eating again, as eating around school was often a little haphazard! Now that placement is over I am back at uni, writing assignments and getting back into training. I have got 3 assignments due imminently, so no rest for the wicked!! Here are some of the things I’ve been eating over the last few days. 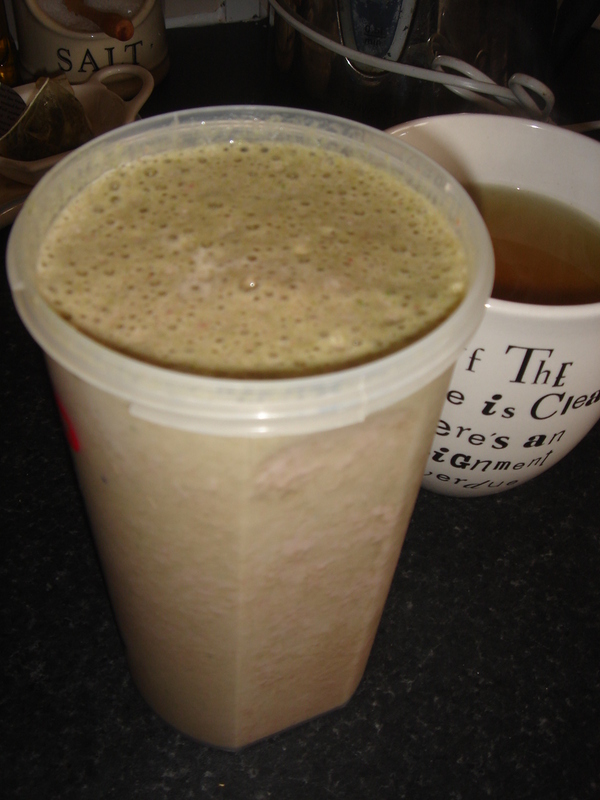 This was a smoothie made with spinach, raspberries, raspberry ripple protein powder, flaxseeds and water all blended. Along with a liquorice and peppermint tea. 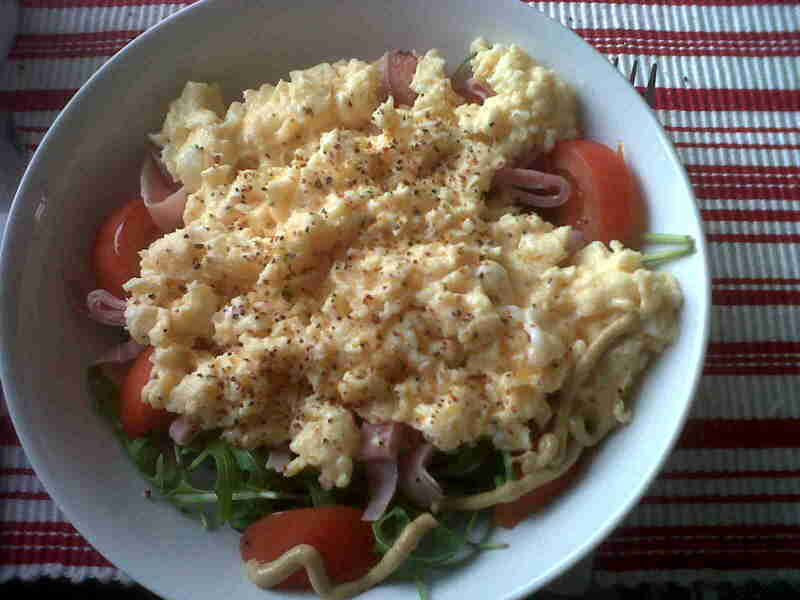 Scrambled egg with ribbons of ham, rocket, spinach and tomatoes. Coconut flour pancakes with chopped banana and Dark Chocolate Dreams mixed with hot water to make a sauce! Crabmeat with spinach, rocket, beetroot, olives, gherkins, tomatoes, cucumber. 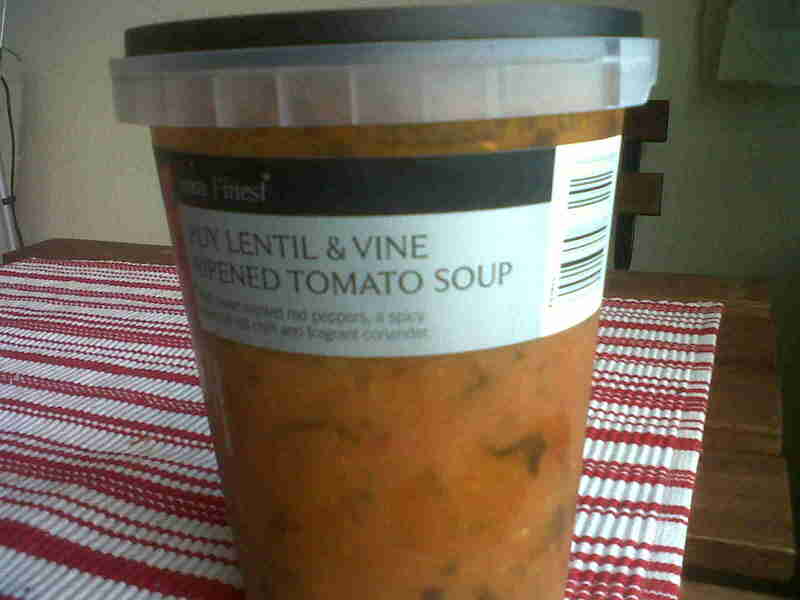 This soup was delicious! 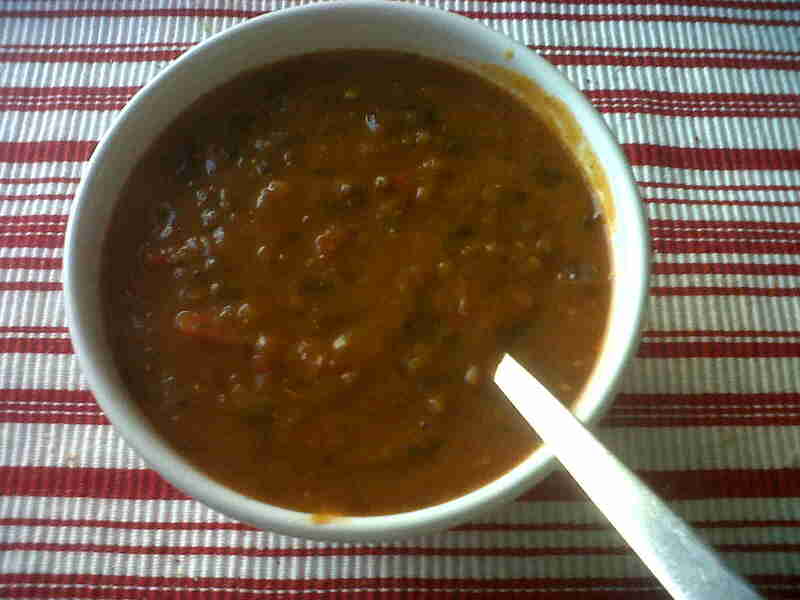 Puy lentil and vine ripened tomato soup. Lush! Wonderful Nandos! 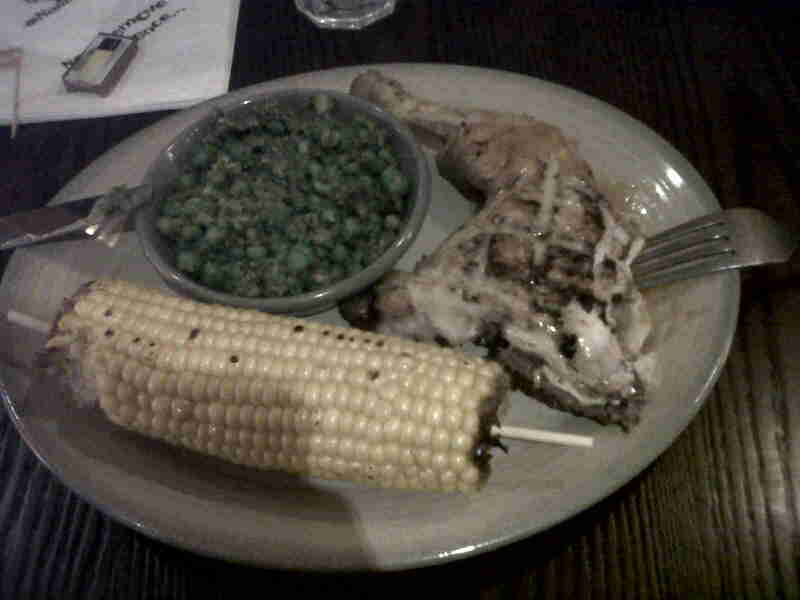 Quarter chicken with macho peas and corn on the cob. 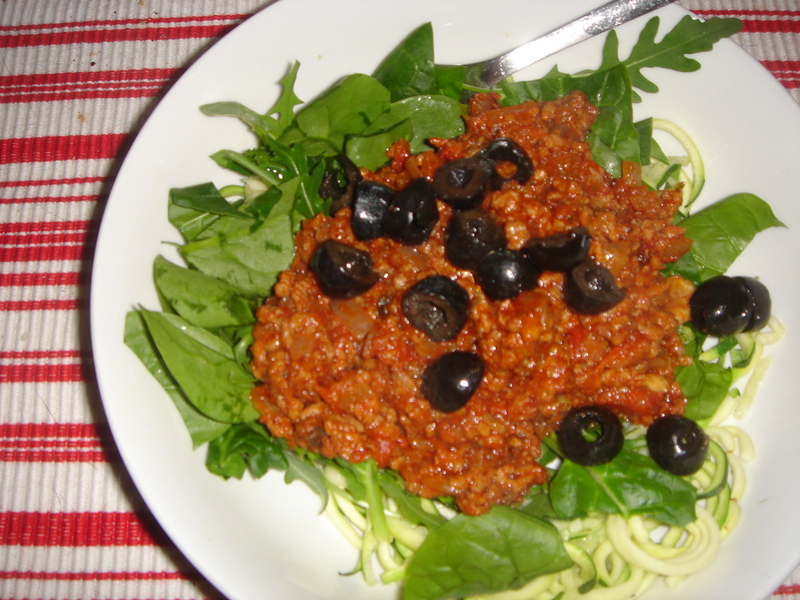 Beef bolognaise served with courgette noodles, spinach, rocket and olives. Same again tonight! Gotta love leftovers! 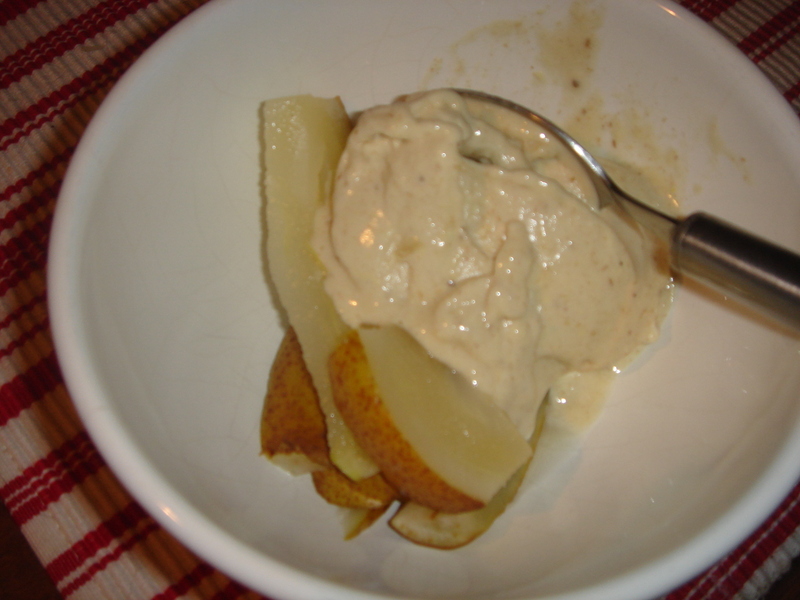 Baked pears with banana and pistachio protein soft serve. Mmmmmm! Other snacks have included hardboiled eggs and lots of veggies. Had a bizzare shopping trip at the weekend, everywhere I went in Tesco people stared at my trolley! I didn’t think it was that odd, but I suppose there was an awful lot of fruit and veg. No more than usual for us though!! Training has been ok, I’ve kept up a base fitness while on placement and was pleased when I was able to still run for 30 minutes without stopping! Marathon training has started with a vengeance, am up to 6 miles. Not long now!!! Today has been spent baking these wonderful specimens, long-run cake with black beans, recipe courtesy of Runner’s World. Nomnomnom! I have also been doing lots of reading for my assignments, it’s hard to jump straight back into assignment-writing mode when I’ve just been in teacher mode for the last 4 months. Need to stay as stress-free as possible, I have a tendency to let it all overwhelm me and then I get in a panic. Hopefully the exercise will help me. This evening was spent completing a great swim session. 72 lengths in total, not bad!! Got so much to tell you over the next few posts. I hope you are all really well, look forward to catching up with you all!! Welcome back and well done you your grade! Everything looks so good, how do you make your coconut pancakes? 72 lengths! That is very impressive! And very de-stressing too I imagine.